Place a custom order for special occasions such as weddings, anniversaries, proms, birthdays or just because! Fill out the form below to request a custom hair accessory design handcrafted by Accented Glory. 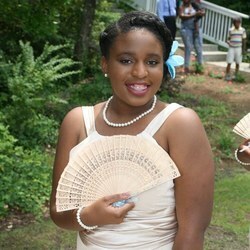 This beautiful bridesmaid is wearing a custom hair accessory design created by Accented Glory. Please indicate order quanity. Also include any special instructions and/or details. Thanks. Want to custom order a Hair Cuff design? Here's how to measure circumference of your braids, twists, or locs. 1. Get a string or strip of paper. 2. Wrap it around your braid, twist, or loc and use a pencil/pen to mark where it comes together. 3. Use a ruler to measure length from beginning to mark. Be sure to submit your measurement with your custom order! Hair Cuff Care: The wire used to create the Hair Cuff design is permanently colored and tarnish resistant, however we recommend you remove your hair jewelry during tasks and activities involving water to ensure your hair jewelry last longer.